A gift certificate is a great way to give a meaningful gift to the bride. Get a group of friends or relatives together and present her with a unique gift! It’s easy, and the bride will have something very special to cherish. 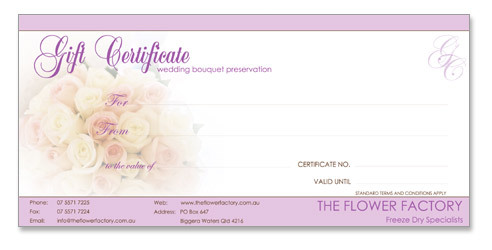 The gift certificate will be customised showing the brides name and who the gift is from. The gift certificate can be mailed directly to the Bride, or to you, the giver to present to the bride at your chosen moment. We accept Master Card, Visa, Money order, direct deposit or cheque. Gift certificates are for bouquet preservation only. The minimum amount available is $150.00. 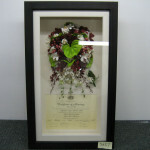 We require a frame selection from the bride no later than four weeks after the wedding date. A gift certificate is considered a reservation and is not refundable for any reason. Our standard terms and conditions apply.